You're browsing: Home / Meri awaaz suno / Happy Birthday Dear Saheb. You will always be with us. Happy Birthday Dear Saheb. You will always be with us. Contributors to this website often wonder if Rafi Saab’s religion has been a stumbling block to Him being denied the highest honor of the Land. That was on my mind too for a while. I do not subscribe to that any more. We must refrain from involving Faith, for it would be totally opposite to what He stood for; what His Family stands for and what His multitude of fans internationally stand for. Take an example. I am a born Hindu for the past nearly 70 years. I have been His pujari for over sixty; my Parents and Mohammed Rafi Saheb are Gods to me. That probably is true of countless of His fans. That said, He would certainly been the recipient by now had He been born a Hindu. Add to that links to regional political affiliations and we have the probable answer. Lataji has done well on all these counts even though her ONLY adversary IS equally if not superbly gifted by the Almighty. At every opportunity and on a regular basis both the Sisters openly exhibit their animosity towards Him even after all these years of His demise. WHAT THEY ARE TRYING TO DO IS TO DELIBERATELY SAW SEEDS OF CONFUSION AND DOUBT IN THE MINDS OF YOUNGER GENERATION AND PARTICULARLY IN THE MINDS OF POWERS THAT BE IN CASE THOSE POWERS ARE ABOUT TO FACE THE TRUTH AND RELENT. I shall not have Goddess Saraswati’s name in vain. At each of the scornful outbursts we the music lovers must reply in kind, with reason. We the fans should posthumously award Him with a special Award- for standing-up to an arrogant bully who over-estimates strength. This entry was posted on Monday, December 24th, 2012 at 4:16 am	and is filed under Meri Awaaz Suno. You can follow any responses to this entry through the RSS 2.0 feed. You can leave a response, or trackback from your own site. Whilst religion shouldn’t hold artists back in receiving awards, I’m afraid in the case of the great Mohd Rafi saheb it obviously has been as everyone is well aware of the contribution the legend has made in Indian Cinema and he obviously hasn’t been recognised for it. This of course is going to make most people think that religion has played a big part. I know it shouldn’t be the case and it’s very sad that it is but many of us know that there were many artists like Dilip Kumar who had to change their name in order to get any where in the film industry and I know that so great was the talent of Mohd Rafi saheb that he didn’t have to do that but I am convinced like many others that had he changed his name or religion he would have been the recipient of many more awards. It is a disgrace! Whilst religion shouldn’t hold artists back in receiving awards, I’m afraid in the case of the great Mohd Rafi saheb it obviously has been as everyone is well aware of the contribution the legend has made in Indian Cinema and he obviously hasn’t been recognised for it. This of course is going to make most people think that religion has played a big part. I know it shouldn’t be the case and it’s very sad that it is but many of us know that there were many artists like Dilip Kumar who had to change their name in order to get any where in the film industry and I know that so great was the talent of Mohd Rafi saheb that he didn’t have to do that but I am convinced like many others that had he changed his name or religion he was have been the recipient of many more awards. It is a disgrace! I am grateful to you for forwarding regularly the RAFIAN updates! I am a Rafi Singer on stage, I wish to share my stage performance uploads on your channel! They are already uploaded on my “YOUTUBE-Dr.G.Rama Narayana”- channel! I started my actual active activity two months ago, which picked up 33 subscribers,with 35 uploads and 2889 views as on date ! Would you kindly guide me how I can forward my clippings! my email id is binus2000@gmail.com for correspondence and cell number is : 9833 250 701. The rafi foundation celebrated rafi saahebs birthday with his grandsons, daughter in law, son in law and actor biswajit ji at the ranga sharada auditorium at bandra, mumbai on dec.24th. after garlanding saahebs portrait, Biswajit and all of us on stage sang : ‘Baar Baar din ye aaye’ and the crowd of 900 went in to a tizzy, clapping and singing in Unison. a full report is being sent to mohd rafi .com along with pictures and video clips. welcome sumita ji and new friends who are mohd rafi lovers. my very belated wishes thru a site [which is ONE of this kind] to The Sant who sang into my heart. Are there any sites created for one Human by his millions of lovers and fans? Would any of the present singers dare hold a candle to this ENORMOUS FLAME who still lights and delights by means of His Sound which radiated from His Soul. I guess this SANT did not initiate anyone into his path, but seekers throng towards his voice. Unconditional love to The Musical Saint and Three Cheers to his lovers. rafi saab was above on religion, cast & creed. he was, he is and he will always be the greatest of great. rafi saab belated happy birthday. Vaise maine 24th Dec’12 ko ghar par aapka birthday celebrate kiya tha. Long live rafi saab. I am greatly thankful to Sir K P Hassan sahab for having view of my post and I also request to all honourable fans of great Rafi Sahaab to get united to awake the film industry and authorities to remember Rafi sahaab with due respect instead of playing dirty polytics. i also felt that rafi saheb was neglected at several occasions for giving due honors by film industry and our govt. 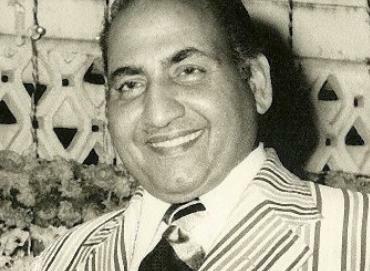 after the death of rafi saheb, his three songs were nominated for film fare award. he should have been honored posthumously by awarding this prestigious award, but they didn’t do that. i am not aware the criteria for selecting a best singer. in my view it should be on the basis of voice clarity, pronunciation, expressions and ability of handling of the ragas used for the song and not on the basis of its lyrics, and sale record. I also agree with prabhakarji that it is the time to unite all fans of rafi saheb and present a memorandum to our govt considering the case for honoring the highest civilian award to the great singer mohd rafi saheb. Happy Birthday, Sir even today 25th Dec 2012, 32 years after you left us, we still Love, to Love someone for a whole life time, You are The Best, there is no one better then you, You are a God Send to us. Fans of Rafisahaab to get united in such a manner that authorities will be compelled to think of honouring Rafi sahaab appropriately at least at par with others who have put less contribution to music world . Rafi Saab Miss you a Lot, kash aap zinda hote aur mein aapse mila hota. Sir, while wishing Happy 88th birthday to great Rafisahaab, with great sorrow in mind I sincerely request all respected fans of Rafisahaab to get united in such a manner that authorities will be compelled to think of honouring Rafi sahaab appropriately at least at par with others who have put less contribution to music world still they are already honoured and are now busy in bringing down glory of Rafi sahaab by going down to any level with mischivious hook and crook. This is my humble request to all great fans to get united for this holy task and get succeeded, God will help you. Simply writing comments on this web site will not serve the purpose. I am also sorry to mention here that even film industry also have not exteded due respect to Rafi sahaab and alway tried to humilate him by creating comparision with less talented singers. In fact I being a Hindu never thought about Rafi saab’s religion. He himself is a religion for music lovers like us.. YOUR WERE INCREDIBLE AND A PHENOMENA. YOUR QUALITY OF VOICE AND RANGE IS UNBELIEVABLE, OUT OF THIS WORLD. Happy Birthday to the greatest Singer and humble human being. We miss you everyday. Thanks for all the pleasure you were giving, and still give. My day starts with you and you are always there for me in every phase of my day to day life Rafi Saab. Million thank you are not enough. happy birthday to the singing emperor mohd rafi saaheb and greetings to all mohd rafi saaheb lovers….